CRN, the shipyard specialising in the construction of steel and aluminium pleasure vessels between 50 and 90 metres in length, held a private ceremony this morning to launch the refit of a 46-metre vessel. 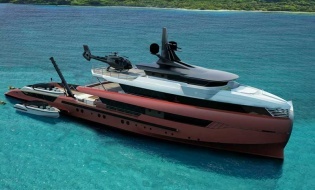 The yacht - designed by CRN’s Engineering Department, in cooperation with the international design firm Nuvolari Lenard, which pencilled her outer lines - develops over 4 decks and can accommodate up to 12 guests in her master stateroom and 5 VIP cabins. “Only a few weeks after the launch of the 55-metre Atlante, we are very proud to be launching another magnificent vessel today" - comments CRN Chairman and CEO Lamberto Tacoli – “This is an important and strategic moment for our Shipyard, as it marks the first step along a new development path, the refitting of CRN yachts, which we believe can be an interesting opportunity for our Company's future. The ‘Eight’ is a first outstanding example of this, and we are all feeling great pride". Sobriety and style, streamlined and elegant lines, airy spaces and very refined interiors: these are the main distinctive features of this yacht, which stands out for her stylish dark blue hull and her contemporary, sophisticated décor - a fil rouge that runs through the different onboard areas and rooms. The ‘Eight’ is equipped with two 3512 B KW Caterpillar engines that push her to a maximum speed of 16 knots and a cruising speed of 15 knots.